Kudos goes to Redditor eavesdroppingyou for spotting this little trick that lets you free up space on your iOS device by renting a very large movie. Put simply, renting a title larger than the remaining capacity on your device forces iOS to use a hitherto undisclosed clean-up routine, thereby freeing-up space. Even if the download is way too big, it’ll still try to free-up space. Neat! As a trick, this is only really for devices that are severely running out of storage space, and is less effective if you simply want to boost a quantity of existing free space. Start by checking how much free space you have on your device. 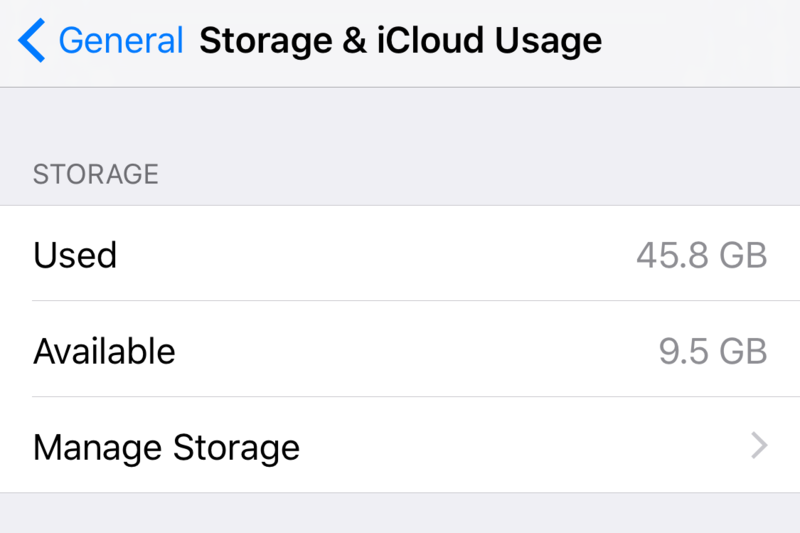 Open the Settings app, then tap General > Storage & iCloud Usage. Look under the Available heading. In my test I had 9.01GB free, for example. Now open iTunes Store on the iOS device, and attempt to rent a very long movie in HD. Something like Gettysburg is a good choice, and you can look under the Information heading on the movie’s description to see the total file size it’ll consume. Remember: It must be MORE than your existing free space! 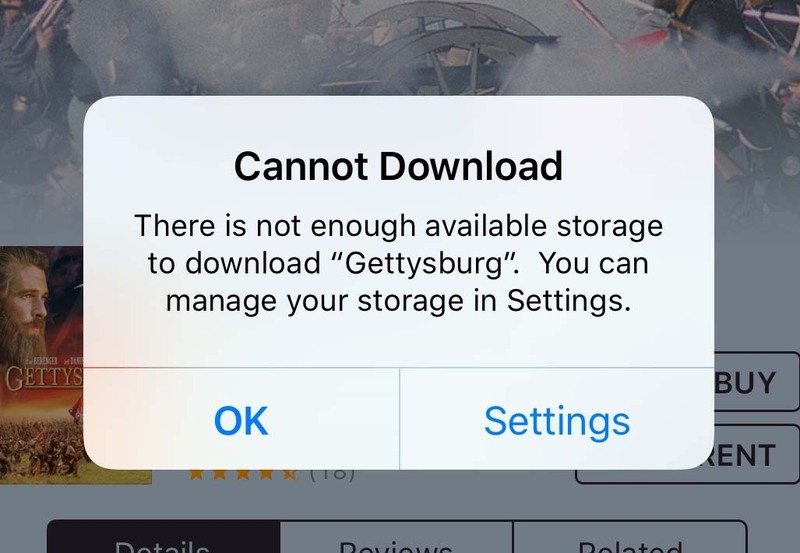 Gettysburg weighed in on my iPhone at 11.1GB, for example. Tap to rent the movie. Here’s where it might get a little dicey. It was originally claimed in the tip on Reddit that you won’t be able to actually rent the movie if you don’t have enough free space. In my tests I DID rent the movie, and got charged for it, but then I live in the UK where the rules are different compared to the US. I applied for a refund, and I explain how to do this in the steps below. But let’s first get back to the trick to free-up space. Because the movie is too large for your device, you’ll be told so and asked if you want to switch to Settings to sort it out. Tap to do so. However, there’s no need to do anything in Settings. Just switch to it. By tapping the Storage & iCloud Usage heading you might see that some free space has already been freed-up, but you must now return to the iTunes Store app and attempt to rent the movie again! And again tap to visit the Settings app. Repeat several times. Each time more space will be freed-up. When you cease to free-up space, you can stop – but always keep an eye on that free space quantity vs the size of the movie, because you might end-up accidentally downloading it if you free-up too much space! 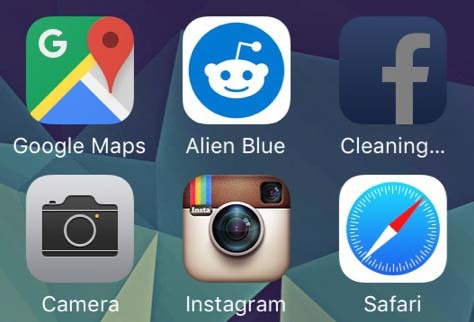 If you switch to your home screen at any point you might even see the word Cleaning… appearing beneath certain apps that can sometimes use a lot of space, like Facebook. If you did make the purchase then you should apply for a refund, as follows. Open iTunes on your PC or Mac, then click the user icon on the right of the tool bar and select Account Info. Click See All alongside the Purchase History setting, then click the Report a Problem button and select the Report a Problem link alongside the movie you attempted to rent. In the Choose a Problem field, choose something like Didn’t Mean To Purchase this Item. If you’re subsequently told you can’t have a refund, repeat these steps and choose instead choose Item Won’t Play or Downloads Too Slowly. If anybody from Apple support gets in touch, tell them the truth: the movie was too large to play on your device! I freed-up around half a gigabyte using this trick, which was very welcome. Others have claimed to free-up several gigabytes.